Two weekends ago, we started a major overhaul of the side yard next to our garage. I blogged a bit about where we started and where I see things going over here. This past weekend the sun came out quite a bit and we all hit the ground running with the project. 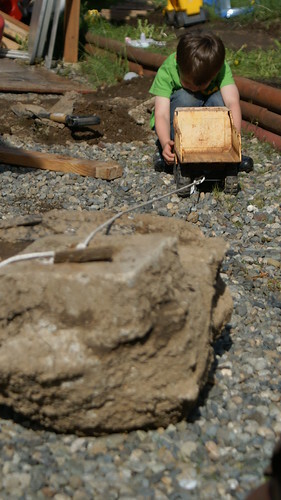 The boys dug up the two cement post footings left from the front of the carport. BTW that's my brother's Tonka from the early 70s. The Snickerdoodle was quite the drill sergeant about getting that work done. I'm pretty sure he was dressed and ready to head outside by 7:30 and was insisting that Mr. BSR get himself dressed and out the door as well. 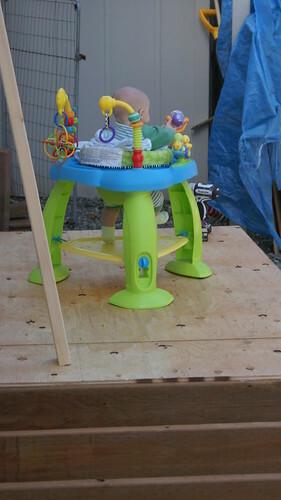 We also managed to neglect the baby quite a bit but he didn't seem to mind much. I love that he's still small enough that he's content to be plopped in an entertainer and left to his own devices . . . and mere feet from a power drill no less. Next summer will be completely unproductive as we will most likely be chasing after him all the time. 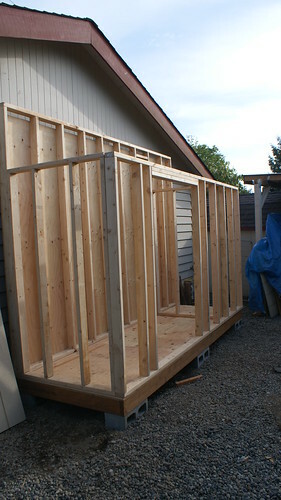 By the end of the day Sunday, we had laid the floor of the shed and framed out three of the walls. To be honest though, I had shed-building dreams all night long and woke up ready to work on it some more. 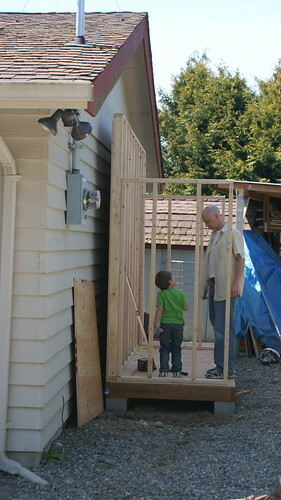 I had other responsibilities though (you know, the whole stay at home mom gig comes first) so I had to wait until nap time this afternoon to build the frame for the front wall where the door will be. As an added bonus, Mr. BSR got home from work early today so he was able to take over with the kids to let me finish what I started. So there it is, all framing for the walls is done. The next thing will be to figure out the angle for the roof. I got a good start on that after the boys went to bed tonight but didn't want to irritate the neighbors with nighttime power tool noises. Maybe I can do a little tomorrow morning while the Snickerdoodle is at preschool and Sugar Pop is taking his morning nap. You are so talented! Is there anything that you can't do? I'm loving our weather, too! Can't wait to see the finished pictures. Thank you Michelle. Looks like we've got another beautiful weekend coming our way. I'm eager to start putting the siding and roof on this thing. As soon as it's done we can move stuff into it and tear out the rest of that ugly carport. I'm so excited.